Butter Chicken is one of the most popular dishes and arguably the top choice among North Indians who prefer non-vegetarian. The dish that we can have time and over again, without getting over it. A bit sweet, tomato based gravy, enriched with cashews, cream and butter, it is an absolute delight for every Non-Veg lover. Let us share the recipe, so you can try your hands on cooking some delicious Butter Chicken at home. In a bowl, mix red chilli powder, ginger garlic paste, salt and curd. Add the raw chicken pieces to the marination and mix well. Keep it in the refrigerator overnight or for a minimum of 6 hours. Roast the marinated chicken in a tandoor or an oven for about 10-12 minutes until it is three-fourth done. Heat half the quantity of white butter in pan. Pour in the tomato puree, and saute for 2-3 minutes. Add cumin seeds, sugar, red chilli powder and salt. Mix well. Add the prepared chicken, white butter, fresh cream, sliced green chillies and crushed kasuri methi leaves. Saute for 3-4 minutes and let the chicken cook. Keep cooking till the Chicken is tender and properly cooked. 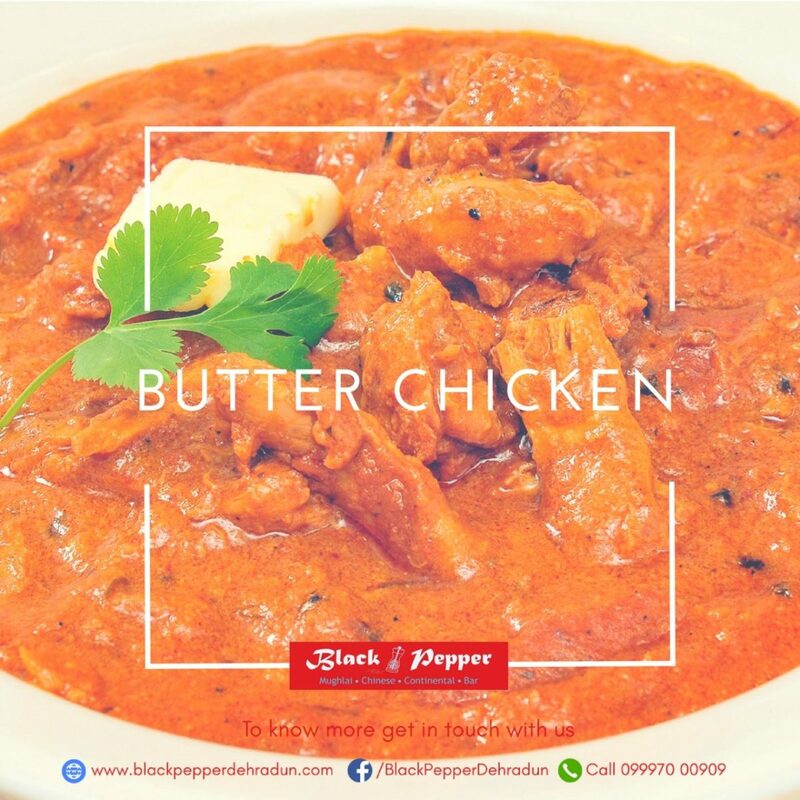 Blackpepper Restaurant, located in the heart of the city of Dehradun, offers you the best Butter Chicken in Dehradun. We are absolutely flooded with people ordering Butter Chicken, all Week. Besides this, Blackpepper offers you an extensive range of Multi-Cuisine dishes. Blackpepper is a fully licensed, fine dining restaurant and also among the top wedding caterers in Dehradun. Feel free to come and try out our food and service and we promise you a delightful experience.